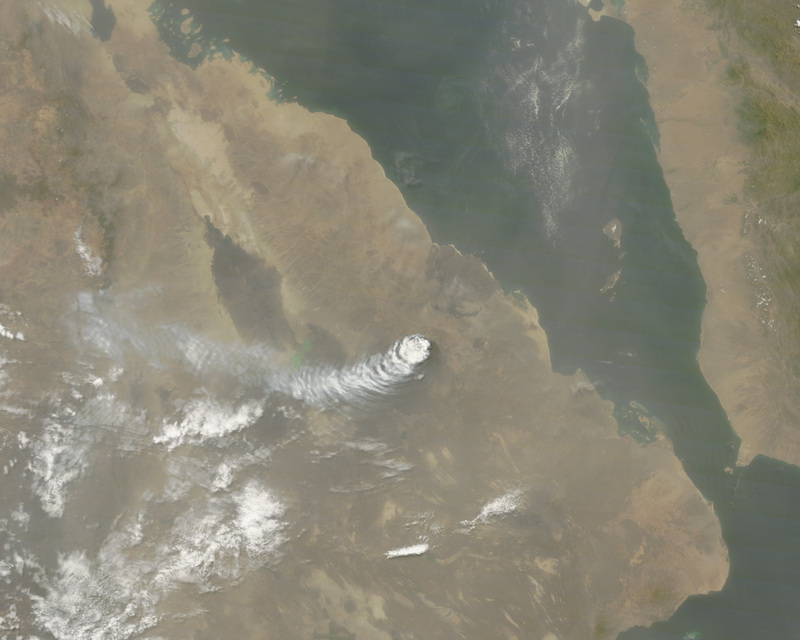 Satellite imagery has confirmed that the Nabro volcano in north east Africa is no longer emitting ash, sulphur dioxide or water vapour. The Eritrean stratovolcano has been spewing ash continuously since it erupted for the time in its recorded history on June 12 last. During the 16-day period much of northern Ethiopia and parts of neighbouring Djibouti and Sudan have been affected by the ash cloud, which also disrupted air traffic in the region. The below image from Modis, captured at 11am (GMT) on Thursday reveals that eruption activity at the volcano has ceased. 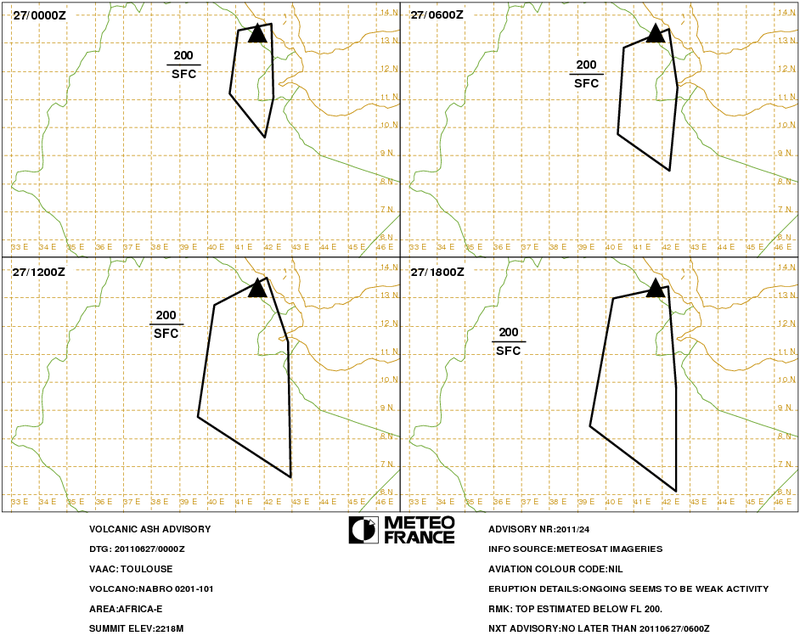 This is also confirmed by the Toulouse-based Volcanic Ash Advisory Centre (VAAC). Nabro began erupting on Sunday 12 June, 2011, the first ever recorded eruption of the stratovolcano. The resultant ash plume, extending up to 15km into the air, led to some flight cancellations in neighbouring Sudan, Djibouti and Ethiopia. The ash cloud was carried as far away as Saudi Arabia, Israel, Turkmenistan, Somalia, the Central African Republic (CAR) and Egypt. 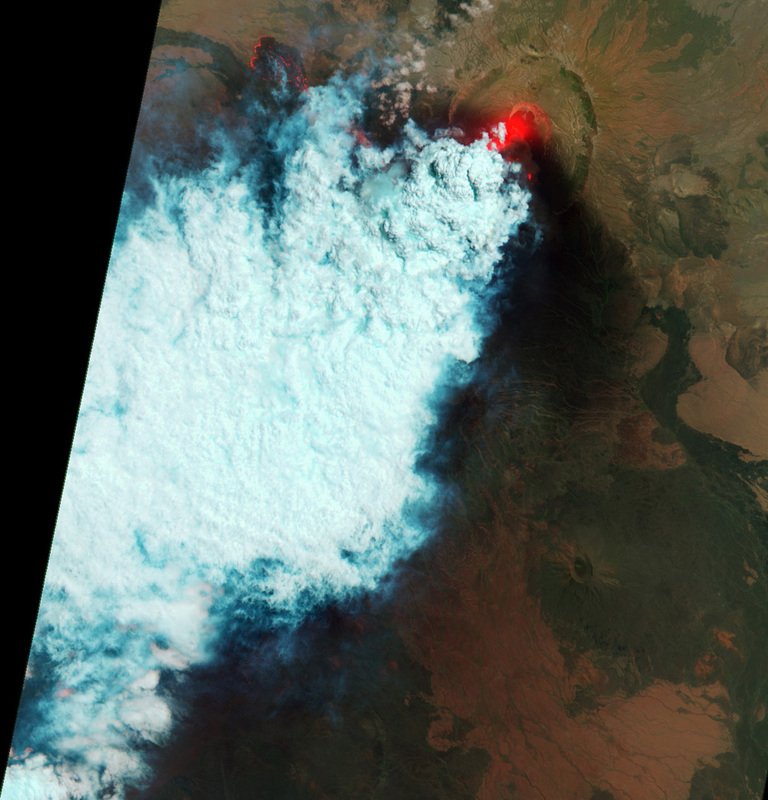 A second eruption on Thursday 16th June sent a massive ash plume westnorthwest over Sudan. The volcano had continued to emit varying amounts of ash, SO2 and water vapour since. Part of the Afar Triangle, Nabro is one of many volcanic caldera complexes in the north easternmost part of the East African Rift valley region. The stratovolcano is located in the Danakil Depression, close to Eritrea’s border with Ethiopia and north of Djibouti, and has not erupted in at least 150 years. According to data, a similar volcanic eruption in Eritrea occurred in 1861, in Dubbi, Southern Denkel. Nabro is the most prominent of 3 large volcanoes (Nabro, Dubbi, Mallahle) in the region, each containing a large summit caldera. Nabro comprises lava domes, lava flows, and two calderas, 8 and 5 km in diameter. The volcano is located along the Great Rift Valley, also known as the East African Rift. the divergent plate boundary extends from the Afar Triple Junction southward across eastern Africa, and is in the process of splitting the African Plate into two new separate plates, the Nubian Plate and the Somali Plate. Seismic activity is frequent in Ethiopia In 1961 alone three thousand tremors were recorded from the centre of the Wollo province resulting in a 20km fissure being opened on the slopes of the Borkena graben. The Advanced Spaceborne Thermal Emission and Reflection Radiometer (ASTER) aboard the Terra satellite observed Nabro on the evening of June 19, 2011. Hot areas are bright, and cold areas are dark. The thermal infrared data were combined with a shaded relief image to show the terrain. The white feature exending to the northwest from Nabro is an active lava flow. A high-altitude plume, likely rich in water vapor, is nearly black, and obscures the erupting vents. A diffuse, ash-rich plume to the southwest of Nabro appears purple. Airmass RGB animation of the Nabro eruption, from 00 UTC 13th June to 1900 UTC 14th June, 2011. NASA Earth Observatory image of Nabro on June 27 by Robert Simmon, using EO-1 ALI data. Caption by Robert Simmon. We're still getting little in the way of news about the Nabro eruption from Eritrea - I've been looking around and the best figure I've found is that at least 3,500 people and up to 9,000 that have been effected by the eruption (and 7 deaths ) at the remote caldera, although that number is likely much higher when you include people in Ethiopia as well. According to this report, the flow has covered 20 km, but I'm not sure if that means it has travelled 20 km or covers 20 square kilometers (my guess is the former). The best evidence we have of what is going on are the excellent images taken from space of the activity at Nabro - you can check out the full gallery of images from the NASA Earth Observatory . The latest image (below) shows the strong plume coming from the southern edge of the caldera along with the lava flow to the west-northwest that is still degassing - not too surprising from a hot, low viscosity basaltic lava flow. The plume is still very robust, albeit very white suggesting a lot of steam in the plume with the significant ash as well. 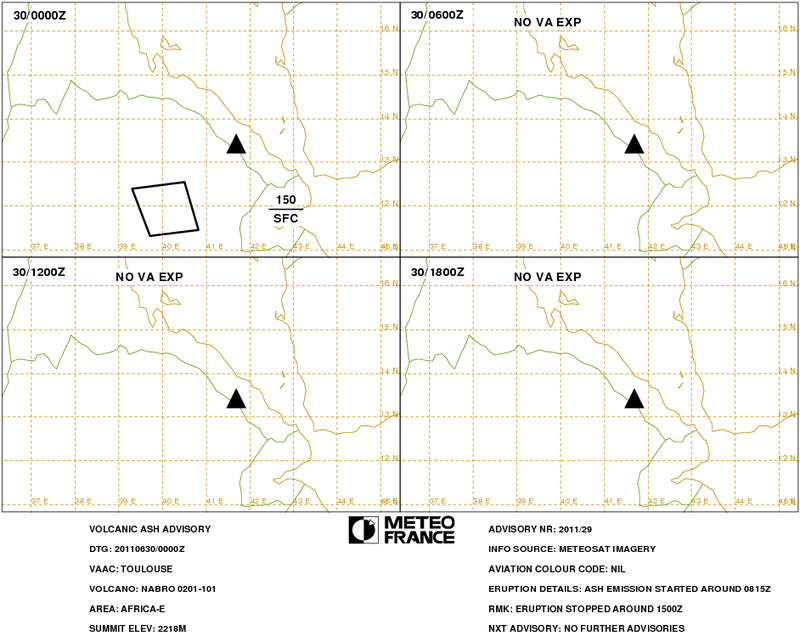 The latest VAAC statement from Toulouse says that no ash is visible in the satellite imagery, but as recently as yesterday there was still a small plume reported over eastern Africa - and a small plume (top left) was seen in the satellite imagery last week as well. The activity at Nabro as seen on June 24, 2011. The eruptive activity continues to have both a prominent explosive component (plume) and lava flows. Image courtesy of the NASA Earth Observatory. Click here to see a larger version. UPDATE 2:30 PM Eastern: I've added a short wave infrared/infrared/visible composite of the Nabro eruption as well (below; again, thanks to the folks at the NASA EO) that clearly shows the lava flows to the WNW. Short wave IR/thermal/visible composite image of the Nabro eruption as seen on June 24, 2011. Click here to see a larger version. 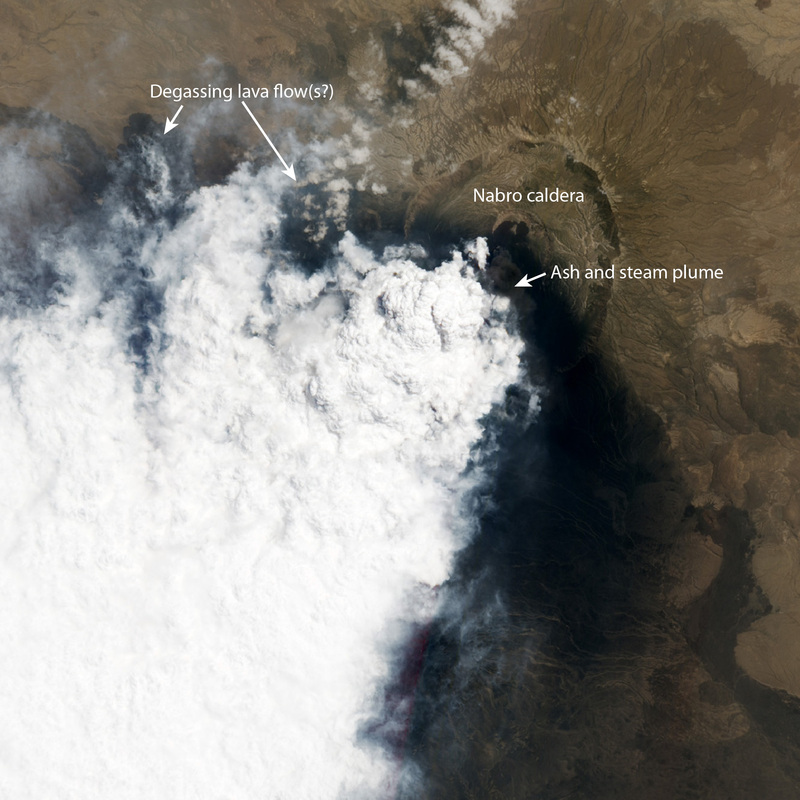 Top left: MODIS image of the Nabro eruption as seen on June 22, 2011. Image courtesy of theNASA Earth Observatory . The Internet is awash with predictions that the world will come to an end next year, based in part on an interpretation of the ancient Mayan calendar which claims that December 21, 2012 marks the end of the current era. The residents of Bugarach, a small hamlet in southern France, are both shocked and perturbed by the rising influx of doomsday believers who are convinced that their tiny town is the only place that will survive the 2012 judgment day. Resting in the foothills of the Pyrenees, a region once home to the mysterious heretic sect the Catharas before they were driven underground in the 13th century, Bugarach has inspired countless myths over the years. These days, apocalypse devotees, dressed in white, are fast becoming a familiar sight in the picturesque village, population 194. They are drawn here by a myriad of New Age theories including claims that a nearby rocky outcrop, the Pic de Bugarach, harbors an alien technical base. "These blasted prophets from all over the world have turned our mountain into some sort of UFO garage," Jean-Pierre Delord, mayor of Bugarach, told Reuters. "You may think it's funny, but they're deadly serious... The end result is that all these fanatics are coming here to hide out," he said. A local woman walks through the sleepy streets of Bugarach. Surrounded in legend for centuries, Bugarach has become a focal point for many Apocalypse believers as rumors have circulated that its mountain contains doors into other worlds, or that extraterrestrials will return here on Judgment day to take refuge at their base. "The aliens will get here soon, we need to prepare for their arrival," said 42-year-old Kean, who travelled here from the Netherlands to witness the return of the otherworldly beings. Dressed in a white tunic symbolizing the purity of his quest, he had just finished telling three new arrivals they would be building a bread oven at the settlement, and that those participating would get a 50 percent discount on their stay. Locals have dubbed the famous Pic, rising 1,230 meters (4,035 feet) above sea level, an "upside-down mountain" as the top layers of rock are said to be older than the lower layers. The abundance of limestone rock and caves in the area has inspired stories of underground caverns and networks of tunnels, perhaps built during the war or even by the Cathars. From there, it is a bit of a leap of faith to the idea that the place could contain a magical underground hiding place or escape route from Armageddon. The view of Bugarach from above. Jean-Pierre Delord, mayor of the village of Bugarach, poses in front of the peak, the high point of the Corbieres massif. More than 20,000 visitors have flocked to Bugarach since the start of the year. That's more than double last year's figures, according to Mayor Jean-Pierre Delord. This has France's sect watch dog, the Miviludes, worried. They've put the city on their radar, fearing it could become the site of mass suicides such as those in France, Switzerland, and Canada in 1994 and 1997. In those cases, 74 members of the Order of the Solar Temple, including 11 children, died in a series of apparent collective suicide pacts and murders. The head of Miviludes, Georges Fenech says he flew over the area in a helicopter recently and saw six settlements of the U.S.-based Ramtha movement, founded by J.Z. Knight in 1998. "We don't want to be paranoid, but we are taking this seriously," Fenech told Reuters. With the recent spate of violent natural disasters adding to a sense of imminent doom and doomsday predictions making international headlines, the number of visitors to sleepy Bugarach appears destined to rise until December 21, 2012.
ouTube - Thousands evacuated amid North Dakota floods: " "
Strong volcanic activity continued at Nabro volcano, Eritrea in late June, 2011, almost two weeks after the volcano sprang to life after a series of earthquakes shook the Eritrea-Ethiopia border region. The Moderate Resolution Imaging Spectroradiometer (MODIS) aboard the Terra satellite captured this true-color image at 7:25 UTC (10:25 a.m.) local time on June 24, 2011. Shortly after midnight local time on June 13, the volcano spewed a large ash plume about 8 miles (15 km) high and disrupted air traffic over parts of the Middle East. Prior to that day, there had been no eruptions of this volcano during historic times. The initial eruption contained large amounts of ash as well as very high levels of sulfur dioxide. By June 20, the Volcanic Ash Advisory Center reported that the sulfur dioxide eruption continued. In this image, the large red hotspots represent areas of increased surface temperature, an expected result of volcanic activity. A very large, white, billowing plume can be seen rising from near the hotspots and blowing to the southwest. The difference in the character of the eruption can be seen by comparing this image to the MODIS Image of the Day for June 21 (image captured on June 19), when the large plume was primarily dark brown in color. On June 22, a report from the Eritrea Ministry of Energy and Mines, Eritrea stated that the ash and lava emitted from the Southern Red Sea region volcano has created a new land mass measuring hundreds of square meters. YouTube - THE SUN TODAY 21 June 2011 - Solar Storm Heading Our Way.mp4: " "
Ash spewing from the Nabro volcano in Eritrea has covered villages in Ethiopia, affecting at least 5,000 people, aid workers say. Initial reports said eight villages in the Biddu district of Ethiopia, close to the border, were covered by volcanic dust. Villagers have been left without food and traditional springs and streams have been polluted. The Afar regional government says the numbers affected could rise sharply. Save the Children told the BBC the authorities had sent a team to conduct a detailed assessment of the situation. An initial report by the regional government says the situation in border villages is a serious concern. "Many community members and especially children are reported sick and in desperate need of medical attention," said Teshome Assefa, of Save the Children. "Vomiting and retching are common." The whereabouts of one community living close to the eruption is unknown. The Nabro volcano has sent the plumes of ash 13km (eight miles) into the air. The FINANCIAL -- WASHINGTON, June 23, 2011 - The World Bank Board of Executive Directors today approved an International Development Association (IDA) credit of US$60 million in additional financing to the Government of Ethiopia in support of its efforts to sustainably increase agricultural output and productivity in the Project Area. This objective will be achieved by developing 20,000 ha of irrigation and related infrastructure (drainage and access roads), providing support to the Government, and the project beneficiaries for agricultural and market development and for sustainable irrigation management. Irrigation development is a key priority of the Government of Ethiopia (GoE). In the new Growth and Transformation Plan (2010/11 – 2014/15), the GoE’s five year strategy, “Maintaining agriculture as a major source of economic growth” is stipulated as one of five central pillars to drive growth and development in the country. The plan outlines that “Expansion of small scale irrigation will be given priority while due attention will be given to medium and large scale irrigation to the extent possible”. Ethiopia’s current emphasis on expanded investment in irrigation has benefited from achievements in recent years under the Nile Basin Initiative (NBI) which was actively supported by the World Bank in the past years. The Eastern Nile Council of Ministers (ENCOM) decided in March 2001 that funding should be sought to advance studies of promising irrigation and drainage sites to feasibility and design level. In October 2004, ENCOM agreed to fast-track the preparation of the Irrigation and Drainage (I&D) project which was then prepared by the GoE. The project was approved by theWorld Bank ’s Board of Executive Directors in June 2007 at the same time as the West Delta irrigation project in Egypt. The proposed additional financing (AF) would help complete the original project objectives in the context of an unanticipated financing gap. Detailed engineering designs have produced higher cost estimates than the preliminary cost estimates based on the conceptual design used for the purposes of project appraisal. The additional funding will allow the GoE to complete the construction of the two large irrigation schemes initially included in the project to their full extent, namely Megech-Seraba and Ribb schemes. The financing would cover cost increases, a provision for small post-construction improvement works, and a significant increase of the budget allocated to the implementation of the Environmental Management Plan of the two schemes based on the detailed costing provided in the respective Environmental and Social Impact Assessment (ESIA) reports. Despite the significant cost increase, the revised economic analysis shows that the economic rate of return for the project is still significantly higher than the cost of capital. “This project has the potential and the ambition to transform the agricultural practice in the Project Area from subsistence, low input-low output type of farming to a more entrepreneurial type of farming generating surpluses out of which the smallholder beneficiaries will be able to cover the cost of irrigation service, thus ensuring long term sustainability” said Francois Onimus, the World Bank ’s project task team leader.